If you stick around Istanbul long enough you’re likely going to run into a Whirling Dervishes performance. But if you want to see the real thing you have to head to Konya, where it all began. I have to admit that until I visited the festival in Konya, Turkey, I didn’t have a very clear idea as to what the whirling dervishes were all about. Everybody who has visited Turkey has seen images of guys in white skirts and black conic hats, arms outstretched whirling around their own axis. Although I didn’t think of them as some drug-crazed mystics who danced themselves into ecstasy and oblivion, I thought more along the lines of folkloristic dance. Both assumptions were totally wrong. It was winter in Turkey — December to be precise — and cold and miserable, so I willingly followed the suggestion of my Turkish friend who suggested I travel from Didim to Konya and experience what he described as, quote: “a unique opportunity to learn about the Sufi philosophy and the significance of the dance at the site where it all originated.” That’s how he put it in his usual rather flowery way of describing things. But then, the man is a poet, so he must be forgiven. The festival is celebrated each year from December 10 – 17. Konya does have an airport, but given the huge amount of pilgrims and visitors who descend upon the town for the occasion, no flights were to be had, so we opted to go by long-distance coach. Coaches in Turkey are a very popular means of transport and quite comfortable. One drawback though, as I found out to my dismay, is that they do not have a restroom. So you are well advised to time your “needs” to coincide with the stops along the way . . . and be quick about it lest you be left behind — the bus won’t wait and the attendant counts his passengers after the bus has pulled out of the station. Konya, the former capital of the Selcuk Empire is located at the foot of the Anatolian mountains, and our bus journey took nearly 12 hours. Fortunately — and given the low temperature that got even lower the further we got away from the coast — the heating worked wonderfully and we could fortify ourselves on board with plenty of hot tea, snacks and pastries, all served by a male “trolley dolly” in an embroidered waistcoat. Konya is quite big with close to 1 million residents, but when we arrived at the station it appeared as if all 1 million were there hurrying about. The crowds were jostling and noisy, and noticeably in a fine, festival mood. Given that it was a religious festival, I was surprised to find the atmosphere to be closer to that of a carnival than of a solemn pilgrimage. First lesson learned from my poet-friend Mehmet: Sufism and the whirling dervishes are about joy, about love and the celebration of becoming one with God. Gloom and doom or even excessive solemnity have no place in this festival. The venue of the dances is the Mevlana Mausoleum, also known as the Green Mausoleum — ostensibly due to its green-tiled dome. 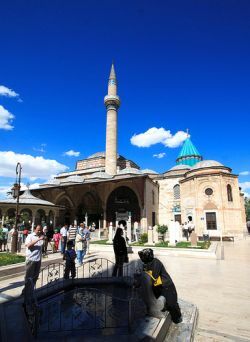 The Persian philosopher, mystic and poet Jalal ad-Din Muhammad Rumi — whose followers and son were the founders of the Sufi Order — came to Konya in the 13th century and was highly revered by the Sultan. He died on in 1273 and is buried in the mausoleum. The sight of his tomb and surrounding chamber, covered in gold and hung with enormous chandeliers, is absolutely awe-inspiring. Mevlana, as he is commonly referred to, taught a version of Islam that puts the emphasis on tolerance, patience, and on attaining happiness through love and the unification with God through constant movement, reflected in the movement of the earth and the universe. Followers of Mevlana are referred to as the Whirling Dervishes as a result of their ritualistic worship service, the Sema, a whirling, ecstatic dance that lasts for a quarter of an hour and performed to the drone of ancient Islamic hymns with the followers draped in long, white dresses. The Whirling Dervishes undergo a long and ardent education and training before they are able to perform the dance, which symbolizes the road from life on earth to heaven. The word “dervish” means “doorway to God” and Sema symbolizes a mystical journey that ends in the return as a better person. Upon arriving we squeezed our way into the large hall located in the mausoleum itself and found seats in the folding chairs that surrounded in row upon row the empty space where the dervishes would appear. Then, the dervishes appear, in single file, their white clothes covered with a black cloak and a black, conical hat on their heads, symbolizing a tombstone. 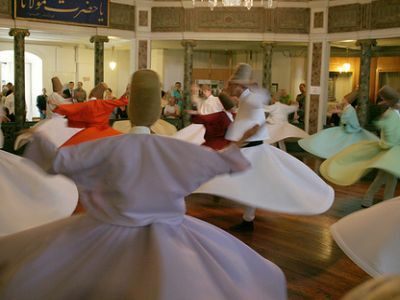 The entire ritual has four parts and after bowing to each other, the dervishes begin their spiritual journey by starting to spin. They turn in ever increasing speed, always from right to left. Their arms, which at the beginning are folded over their chest, stretch out, the right hand pointing heavenwards and the left towards the earth in a symbolic gesture to guide the enlightenment from God towards the mortals on earth. The dance ends with another Naat, prayer and praise of the prophet Mohammed. Mehmet whispered explanations of the different phases into my ear because the multitude of spectators kept an eerie silence. Nothing but the soft movement of ever faster spinning feet, the swish of the unfolding skirts and the monotonous — and at the same time mesmerizing — sound of the instruments could be heard. At the end, I literally had difficulty coming down to earth. Mentally, I was still spinning with the dervishes. The physical accomplishment is astonishing. I looked closely, when, at the end, the dervishes bowed again to each other and I swear, they were not even out of breath. Neither did they even once lose their balance. When we were safely back in our small hotel, I couldn’t help myself. I tried some spinning of my own and was rewarded with Mehmet’s merciless laughter when I toppled after the first three rounds. Seeing the whirling dervishes perform in the place which is most revered by all Sufi disciples, whether they are dervishes or not, is a cultural and philosophical experience which given the chance, no visitor to Turkey should miss. If you’re in other places — particularly Istanbul — you’ll likely see abbreviated Whirling Dervishes performances, but they lack the spiritual essence you find in Konya during the festival, and they are much closer to a tourist attraction than a cultural experience. For the real thing, Konya’s your only option.